Two buttons and two LED’s! Fits PCB's up to 40mm x 80mm, easily assembled! Swemake has a it’s own product range which are available to our customers. 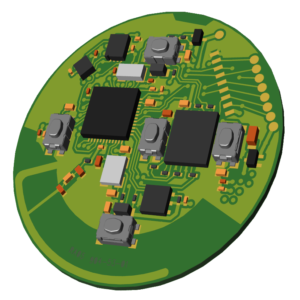 SWE001-1 is a Bluetooth Low Energy platform that may serve many purposes depending on platform variant. It may be equipped with an accelerometer and a gyro from world leading supplier Bosch Sensortech, allowing low power, low noise 16 bit inertial measurements for a wide range of applications. In addition, the platform may be used as a high precision temperature sensor and as a logging device. It can also act as a low cost BLE proximity beacon that advertises ID data compatible with common beacon standards: UUID, Major ID and Minor ID). The BLE-chip is supplied by Nordic Semiconductor and has a Cortex M4 host CPU. Up to five buttons may be configured, allowing for a flexible user interface. The firmware can with ease be customized to fit customer requirements as well as access additional sensors and platforms through the serial connector, and can be delivered with custom casing and in any quantities. Suggested applications are Augmented reality, indoor navigation, gesture recognition, pedometer, fall detection, activity monitoring, action triggers, control device, location beacon or sensor module. A small enclosure suitable for PCB’s with the size 40mm x 80mm, IP4X classified. Supports two buttons and two LED’s, and is assembled with screws.